[By Nick] The holidays might be over but that doesn't mean it's too late for some pumpkin pie ice cream, especially if you consider the fact that January 23rd is National Pie Day. 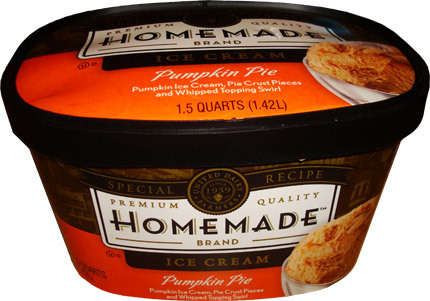 In the complimentary shipment from Homemade Brand, they included a container of their limited edition Pumpkin Pie ice cream. Now I really like pumpkin pie as long as there is no disgusting crust. So many pies have been ruined by that disgusting wrapping of flour. When I was little, I would just eat the filling and leave the soulless crust behind. 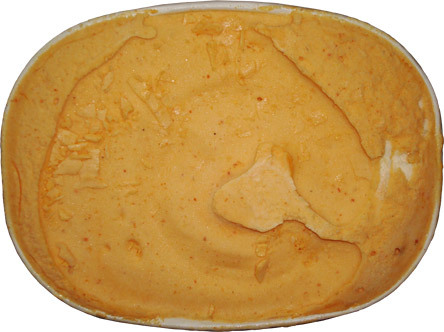 Homemade Brand’s version is made up of pumpkin pie ice cream with pie crust pieces and a whipped topping swirl. Now I’m going to try to put my bias against pie crust aside for this review but I doubt that’ll be fully possible. Also, am I the only one who thinks "whipped topping swirl" sounds funny? I mean it’s swirled in so it’s not exactly topping anymore. Then again, it’s not made out of cream so I guess they couldn’t have called it whipped cream either. Eh technicalities aside, I’m ready for some pie! Well removing the lid, I’m not one bit shocked at what I see before me. 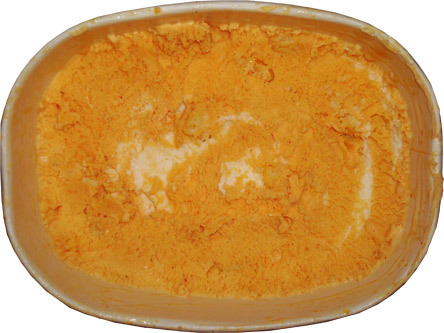 It’s the orange hue you’d expect out of pumpkin ice cream and you can see specs of pumpkin puree and crust pieces. You can only see a little bit of the 'topping' on the right hand side which once again is ironic because it’s nowhere to be found in the TOP layer, but enough with the semantics. Taking my first bite, this is not your average pumpkin ice cream. Unlike most things labeled pumpkin, you can actually taste the pumpkin, which after looking over the ingredients isn’t all that surprising seeing as it’s the third ingredient on the list. All of the spices are perfectly balanced, complimenting the pumpkin and replicating pumpkin pie perfectly. The whipped topping is spread liberally throughout the container but does nothing for taste or texture as the spices easily over power it. If anything, it gives you another color to look at. Now as for those pieces of pie crust, I've got some good news and some bad news. The good news is that they have the taste and texture of a fresh baked pie crust. They’re buttery and flaky with subtle hints of brown sugar. I wouldn't doubt that they bake up actual pie crusts and just crumble them for mix-ins because that’s how authentic they taste. The bad news is that I still really dislike pie crust. I would've much rather had a graham cracker swirl but I’m not the one creating these flavors. I will say that I can tolerate these pieces of crust in the ice cream more than I can in an actual pie. This is definitely a limited edition ice cream you won’t want to miss out on if you even remotely like pumpkin pie. Verdict? It’s pumpkin pie but in ice cream form!